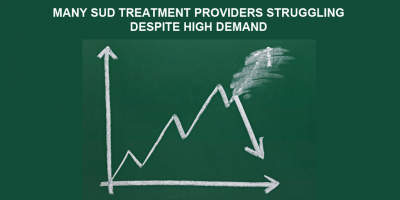 Treatment Providers Struggling: 23% of addiction treatment providers in a small, informal study reported being concerned about their ability to remain in business (page 4). Fewer Patients Received Assistance Paying for Treatment in 2017 vs. 2016: In the midst of the opioid epidemic, the percentage of people who were able to use private health insurance, Medicare, Medicaid or other public assistance to pay any portion of their costs for substance use disorder treatment declined substantially between 2016 and 2017 (page 8). The Use of Medication-Assisted Treatment Is Growing Exponentially: The number of patients using buprenorphine, methadone or injectable naltrexone almost doubled between 2007 and 2017 (page 9). 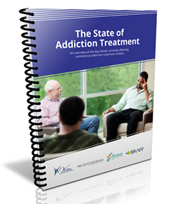 Most SUD Patients Have Underlying Mental Disorders: Among more than 13,000 people entering addiction treatment, 82.9% reported experiencing moderate to severe symptoms of depression, anxiety, post-traumatic stress syndrome and/or an eating disorder at intake. By the time they left treatment, most patients reported that the severity of their symptoms had declined dramatically (pages 20-21). Addiction Treatment Can Be Quite Effective: When researchers followed up with patients at different times in the year following addiction treatment, between 40% and 44% were reachable and claimed to have not used any non-prescribed drugs or alcohol in the last 30 days. The twelve month results are significantly better than the findings from the last major federally-funded addiction treatment outcomes research, the Drug Abuse Treatment Outcome Study (DATOS), conducted in the early 1990s (pages 22-23). Good Addiction Treatment Programs Are Closing. How Do We Stop This? How Should the Industry Respond to John Oliver's Expose? Do You Really Want to Build Your Own Outcomes Management System?